Curious about getting into the deep waters without having to cough out thousands of dollars? It’d certainly be a good idea for you to invest in a kayak rather than a traditional boat. Yaks are quite stable, spacious, and powerful. Most importantly, they’re pretty rugged and dependable besides being quite affordable. But why are some kayaks so affordable? You might be wondering. Well, the recent advancements in technology have meant that so many new factors have come into play. And that way, you can find so many awesome features even without having to spend too much. Indeed, that’s the kind of good news that we’d like to share with you today. What Type of Kayak Should You Go For? Before we jump to more details, here’s a quick summary of the 10 watercraft included in this guide. In other words, you don’t have to read the complete reviews if you don’t have the time for that. Simply cut to the chase; if you so wish. If you’re looking for value, then you’ve got to take a closer look at what this yak offers. To begin with, it’s a 1-person sit on top kayak. That simply means that it is quite easy to control on waters. Its unique design and particularly a broad base provides it with an enhanced stability even when used at high speeds. On top of that, it comes with an awesome mount designed to accommodate different accessories. For instance, it comes with 2 flush mounted rod holders along with an integrated line of gear tracks. Now that you have a clue what a good, affordable kayak looks like, it’s our hope that you’ll gain confidence in decision-making. We look forward to hearing your wonderful fishing stories soon. Cheers to a new chapter in your fishing hobby or career. Yet another awesome attribute of it is that it has a pre-installed toe controlled rubber system. This comes in handy in saving you the energy needed to sustain long paddling. 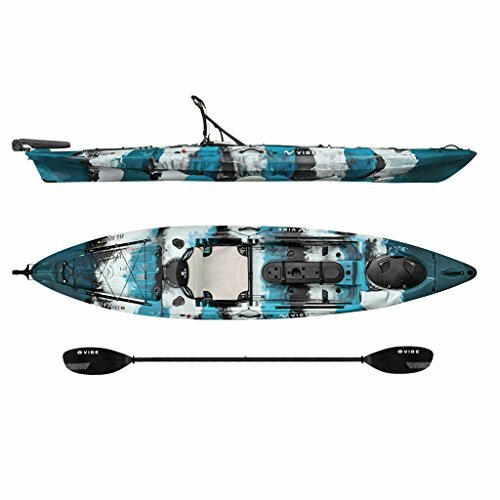 Also, this unique design makes the kayak a must-have especially if faced with choppy water fishing tasks. Our verdict is that the Vibe is best built to put up with strong currents and windy days in general. As far as convenience is concerned, this kayak offers superior comfort. Keep in mind that it comes with multiple storage options. In particular, there’s a large center console boasting a 20-inch oval shape. Then there’s a large bungee rear tank. So, there’s no doubt that the Vibe presents you with the superior comfort you need to enjoy the ride. And it doesn’t matter how long your day will be as this yak has the muscle it takes to enjoy the ride. There’s something unique about the Tandem from Lifetime. In fact, it’s not just one thing – but quite a few things. 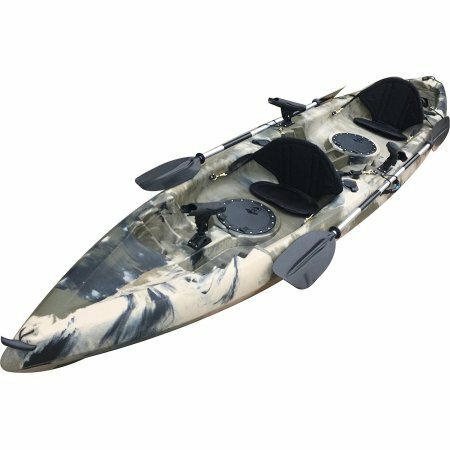 The yak, for starters, boasts a blow molded body which is made from a high-density polyethylene material. This presents you with a superior advantage in terms of strength and durability. It’s no wonder the manufacturer has provided a 5-year warranty for it. Meaning even if something goes wrong as a result of the manufacturer's error, you can always get it dealt with. Moving on this kayak is actually capable of accommodating 3 people. However, it only has two seating space which means it’s primarily a 2-person yak. Further, the Tandem boasts a 500lb weight capacity. 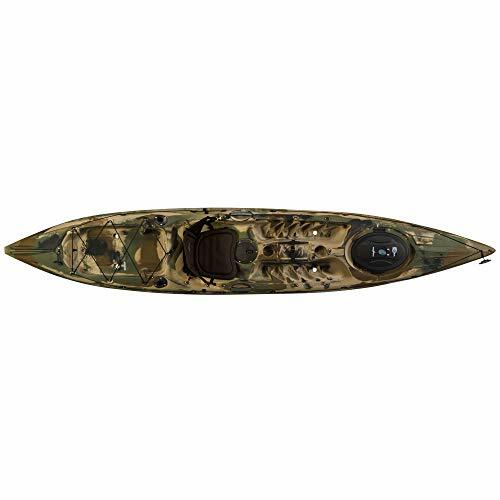 This enhanced weight capacity makes it a perfect bet for anyone looking for enhanced stability on water and added comfort. Its hull design goes a long way to testify just how powerfully made this watercraft is. Carved from a high-density polyethylene and protected with a UV-coating, it’s capable of lasting long. And let’s not also forget to highlight its comfort features among them multiple footrest positions and paddle holders. There are so many affordable fishing kayaks but few of them seem to tick all the right boxes. A closer look at this unit from BKC, however, reveals an entirely different story. The kayak is quite compact in design. This makes it easy to ride even for beginners. It comes with 7- fishing rod holders for extra comfort. Further to that, this yak comes with sufficient waterproof storage hatches. 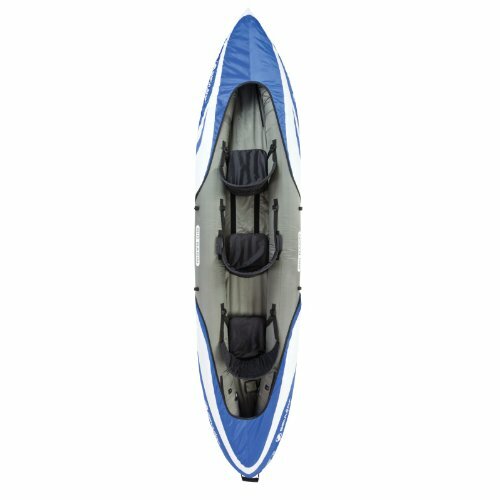 So, if you’re looking for an affordable kayak with dry storage, this one would definitely meet your needs. One thing you need to note about this kind of storage is that it’d come in hand in providing space for your snacks. You can even keep your keys, wallet and even mobile devices within it for added comfort. Sometimes, that’s all the freedom you need to free up your hands. And the more you free up your hands, the greater your level of comfort will be – meaning you can enjoy the trip even more. Above all, this 12-foot kayak is known for its ability to glide smoothly on water. That makes it a perfect bet for enhanced speeds. It is hard to believe that this kayak goes for less than 500 bucks. Why so? Because its body is extremely well-made. And even though it’s not luxurious, it comes with all the parts that matter. For starters, this yak comes with multiple footrests which make it highly accommodative to different styles of riding. As far as stability is concerned, this kayak boasts a stable bottom. That, however, comes at the expense of speed. So, if you’re looking for a fast speed kayak, this might not be the best one to settle for. Another awesome feature that adds to its comfort is its padded seat. This comes in handy in absorbing pressure meaning you can seat on the yak all day with no worries. A closer look at this watercraft further reveals that it comes with front and rear shock cord straps. These go a long way in complementing the 6-inch storage compartments. Basically, stability is the name of the game as far as the Tamarack Lifetime Kayak is concerned. That’s particularly so given its high-density Polyethylene (HDPE) hull design. If you’re a beginner angler and looking for something that’s safe to use, this Pescador yak might be worth trying. Why so? You might be wondering. Well, to begin with, it offers you two seating positions. These provide you with a comfortable, stadium-like seating arrangement. 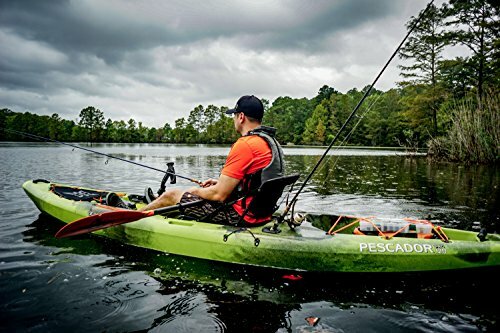 Therefore, the Pescador is not only comfortable but also easy to maneuver. Its storage space is pretty well-thought-out as well. For instance, it comes with a mesh bow cover. You also get a rear tankwell bungee. Toward the middle, you get a center console and a 5 deck plate stern. So, really, there are no limits as far as storage space is concerned in this case. The rotomolded yak is best suited for mild but deep waters. That’s because of its relatively rounded hull as well as a flat bottom. Further, its bright color makes it easy to spot. This is a major benefit, especially in emergency situations. Experts generally recommend fluorescent green or moss camo yaks for extra safety. Included alongside the seemingly perfect yak are 2 molded holders for the rod. You also get molded-in cup holders. All those features are ideal for your general comfort. Further, this kayak is loaded with a handy tackle box. This is strategically located at the front seat. That way, you can easily reach for your tackles whenever you need them without having to struggle. Besides that, there are 2 fishing gear tracks included. That’s alongside a great, UV-finished exterior. So, basically, this is a must-have yak if you’re after good value for your bucks. This is the first affordable inflatable kayak featured on this review – and there are good reasons for that. 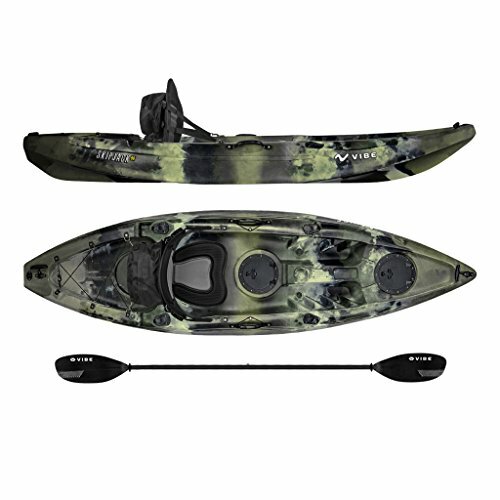 To begin with, this watercraft boasts an excellent heavy-duty PVC construction. This kind of construction is the reassurance you need to navigate through stormy waters. It’s also the stable cover you need to remain safe even in case of an accidental puncture. In fact, the Sevylor comes with multiple chambers. Guess what that means? In case one of the chambers is punctured, you can always rely on the other chambers to keep you safe until you navigate off-shore. The challenge, on the other hand, is that you’d need to take a lot of time when inflating this kayak. But if that’s all it takes to enhance your safety, we believe it’d be okay to do it. The Sevylor’s airtight design comes in handy in guaranteeing that this yak won’t leak at any time. And the best part is that you also get a handy Boston Valve. What’s a Boston Valve? Well, this is a simple valve that comes in handy in inflating and deflating the kayak. And that can indeed go a long way in simplifying this all-important process. Another awesome feature of the Sevylor is ta it comes with adjustable seats. These can easily be adjusted for your comfort at all times. Lastly, you get a free spraying kit that comes in handy in blocking splashes and keeping the entire unit dry most of the time. This kayak has earned the reputation of being the best for ocean use. That’s partly because of its enhanced stability and speed. Its narrow and relatively triangular hull is pretty much all you need for a fast and stable ride. In particular, its bottom is significantly wedge-shaped. That design helps you to slash through water, quietly. As you know, that can go a long way in helping you deliver more fish home. Moving on, this kayak comes with a 4-way-adjustable seat. You simply need to tweak a few aspects of it to enjoy all-day paddling. 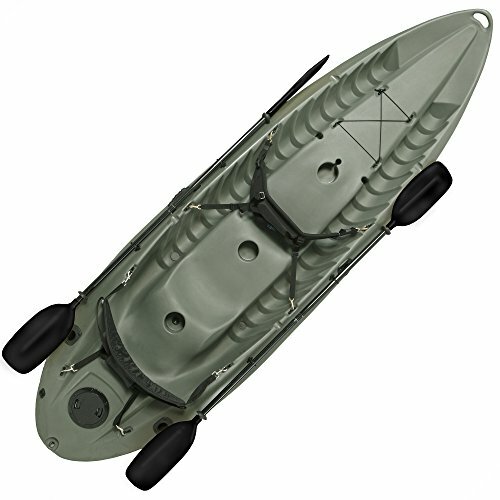 Another thing is that this kayak boasts an easy-to-open front hatch. This provides you with a decent, dry storage space. Most importantly, this can accommodate multiple rods and is pretty safe as a storage compartment. Like to carry coolers with you? This 13-footer has all the capacity you need to accommodate those along with a tackle box, scuba tank, bait well, and crate. Most importantly, you also get ample paddle keeps along with two cup holders. And the icing on the cake – you get a lifetime warranty when you settle for this yak. For a comfortable ride with your buddies, you’d need a spacious kayak. This 3-person SOT kayak from BKC is the perfect choice for buddies and families. Each one of its 3 seats is comfortable and flexible. This, therefore, makes this an awesome kayak for all day use. Moving on, this unit presents you with a 440-pound weight capacity. That’s a pretty generous one although there’s a caveat. For you to stick to this weight limit, we’d suggest either carrying two other light adults with you. Alternatively, you can accommodate two adults and a kid. Otherwise, this watercraft may become quite unstable if you exceed its weight capacity. Moving on, the BKC boasts multiple storage areas. Therefore, you get a dual watertight storage compartment which comes in handy when you want to store your cargo. One challenge that we all face when fishing is where to put the kayak. Ideally, there should always be a convenient space on which to place your paddle. Without this, you’d really struggle to do other tasks that require your two hands. Fortunately, with the BKC, you get an ample paddle rest. This can safely hold your paddle even when you don’t need to use. By extension, this handy feature prevents paddle overboard loss. If you’re in love with the vintage stuff, then the Discovery 119 from Old Town is sure to resonate with your needs. But besides the look, a closer look at it reveals that it’s made with your convenience in mind. For instance, it is pretty light in weight. That means you can comfortably take it with you whenever and wherever you go. The second benefit is that it’s pretty efficient and stable. That’s all thanks to its 3-layer roto-molded polyethylene construction. Indeed, this design comes in handy in providing you with years of worry-free service. On the flipside, this kayak is best suited for solo use. Therefore, if you’re looking to bring your buddies along, you may need to look for a larger alternative. As far as comfort is concerned, we’d give this a 3.5 out of 5 in rating. Its interior is made of nylon web seats. We could have expected to find something better especially given the price of this yak. As far as color is concerned, you get the freedom to choose between, green, red and camo variants. Moving on, you also get some pretty durable vinyl gunwales, shallow arch, and an awesome finish. In addition, this boat boasts some pretty shallow arch sides. These are pretty convenient to use especially when stability is of the essence. Further, this unit presents you with a moderate straight rocker to a further enhanced surfing experience. 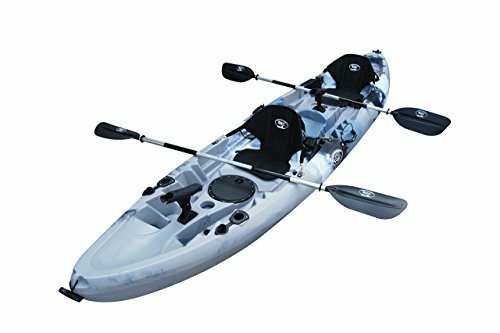 Wrapping up our list of the best fishing kayak under 1000 is this one-person yak. Available in hunter camo, blue camo, and sea breeze variants, the Skipjack is a perfect bet, any day. The yak spans 9feet and weighs a paltry 46 pounds. So, not only does it provide you with adequate leg room but is also easy to carry around. Its rounded hull comes in handy in providing you with an extra layer of safety. As you know, rounded hulls tend to provide a wide surface area adding onto stability. This watercraft’s sat is also quite accommodative and comfortable. Plus you also get plenty of dry storage space along with handy bag inserts. This is easily the first question likely to dominate your mind especially if you’re a first-time yak shopper. Basically, one factor that should determine the kind of watercraft you settle for is your height. You basically want to make sure that the height of your yak can accommodate you, comfortably. Also, you want to consider your weight. If you weigh close to 300 pounds then you’re better off going for a kayak with a 400-pound weight limit and above. That way, you’ll have the freedom to carry extra gear and paddlers with you. Further, this can come in handy in case of an overnight fishing trip whereby you’d need to camp. Do the dimensions of the yak matter? The short answer is yes. A wide kayak tends to be extra stable and, therefore, convenient for beginner fishers. It goes without saying that a wide base goes a long way to provide you with extra stability. But even then, thinner and streamlined kayaks are generally best suited for experienced anglers. Generally, a narrow, streamlined design reduces drag and also makes it easily possible to paddle faster. So, if you’re looking for fast speeds, you certainly want to keep that consideration in mind. In the real sense, does the color of a kayak matter? Well, the answer to that question may vary depending on who you ask. However, a majority of fishing gurus seem to agree that it indeed, matters. First and foremost, if you’re a beginner angler we’d recommend choosing a kayak that’s easily visible. For instance, it should be brightly colored in yellow, orange, fluorescent green or red. Such colors would make it easier for other anglers to spot you from a distance. 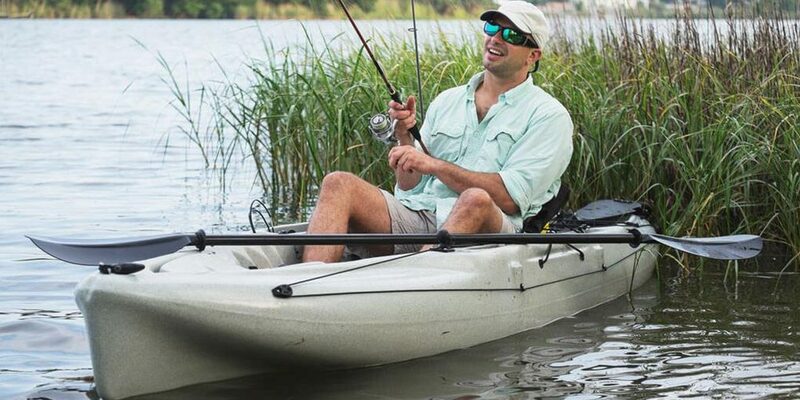 The downside to choosing a bright colored kayak is that it can reduce your chances of catching fish. That’s because the bright color would warn the fish of your presence. In that regard, if you’re looking to double or quadruple your catch, we’d recommend going for a blue boat. You can also go for any other color that blends in with the water. However, scientists have confirmed that fish don’t see as many colors as humans do. They are, however, attracted to particular shadows. The name hull when it comes to kayaks simply refers to the bare bones of the structure. It’s the skeleton that holds your yak together. Without it, it wouldn’t be possible to attach bungees, pedal drives, seats, mounts, and so forth. For that reason, you should always focus on getting the best hull available. Worth noting, however, is that hulls are shaped with specific purposes in mind. Our general recommendation is that if you’re planning to fish on shallow and calm waters, a short, rounded hull would do. However, if you’re a sea angler, you’d be best placed to use a kayak with a long and pointed bottom. Of course, the bottom should be flattened. Just to give you a rough idea on what to expect as far as hulls are concerned, here are some quick nuggets of wisdom. A rounded hull typically comes with rounded edges. It almost has a torpedo shape. This shape is ideal for high speeds as it reduces water resistance. The V-shaped comes in handy it cutting through the water. Therefore, these kinds of hulls are ideal when one wants to navigate in a straight line. They’re, however, tippy and are best used by experienced anglers. Flat hulls are the best bets for beginners who look for primary stability. They’re also ideal for long hours of fishing especially by anyone who prefers to do so from one spot. Their primary advantages include great maneuverability as well as stability. Each trip to the waters is bound to come with its fair share of surprises. And for that reason, you need to have an adequate storage capacity. Of course, you need a larger storage capacity if embarking on a longer ride than if starting a short on. There are two types of storage and these are – dry storage and wet storage. Dry storage kayaks come in handy in providing you with room to keep your precious items without them getting wet. Wet storage, on the other hand, would come in handy especially when you need to store your catch. That said, most kayaks found within this price range tend to come with the dry storage space only. Unfortunately, there are some which don’t come with it! It’s essential to think about those two elements before buying a kayak. It basically should be comfortable. In particular, it should have an ergonomic seat. For instance, it should have a well-made backrest. It also should be made from a cushioned surface for long-term comfort. 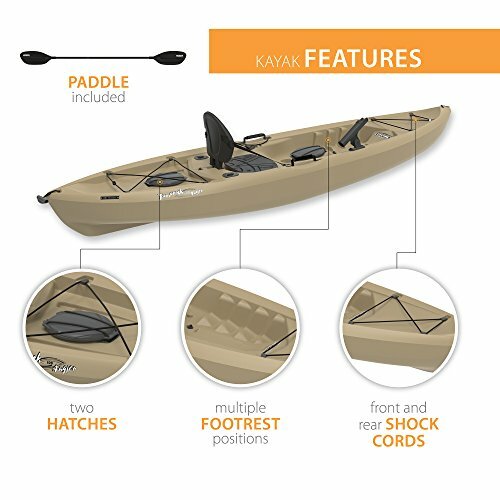 The kayak should, further, come with all the convenient holders meant to help enhance your level of comfort. And besides that, there should be lots of spaces to keep your handy accessories. Ultimately, you want your safety to be well taken care of at all times. And that way, you can enjoy the ride with extra confidence. In order for your kayak to serve you for long and provide you with an enhanced value proposition, you need to take good care of it. The only way to do that is by adhering to the following simple tips. (1)Always inspect your kayak to check for any hairline cracks, hull damage or signs of water leaks. Get a professional to fix those. (2)If you want to clean your kayak, we’d recommend doing so using clean water and a mild dishwashing soap. (3)If you own a fiberglass or plastic watercraft, be sure to spray it with UV protection at least thrice per year. (4)If you’d like to eliminate some minor scratches, we’d recommend using a 600 to 800-grade sandpaper along with a fine polish abrasive. Great selection of kayaks to choose from. thanks for sharing!